Jennifer wrote about her "Cannes moment"
TV actress Jennifer Winget may not have sashayed down the red carpet like Deepika Padukone, Aishwarya Rai Bachhcan or Sonam Kapoor did but she sure did enjoy her very own "Cannes moment." Jennifer, who appeared to be shooting in a village in Maharshtra named Kanjurmarg, thought of a brilliant play or words to refer to the location as "cann-jurmarg" and wrote that how she turned her Cannes dreams into reality and how not going to the French Riviera did not stop her from enjoying a Cannes special moment. Sharing a photo of herself, Jennifer wrote: "Not walking the red carpet in Cannes doesn't stop me from having my own little Cannes moment in cann-jurmarg." 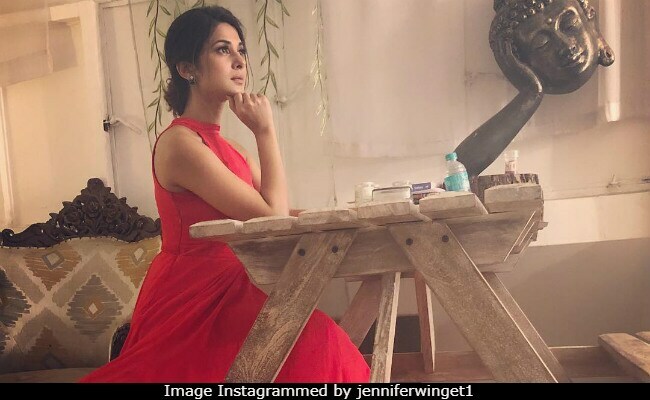 Jennifer Winget can be seen looking lovely in a scarlet floor-sweeping dress, with her hair tied in a soft bun at the back. Shared in the wee hours of Tuesday, Jennifer's photo has garnered over 5 lakh likes in less than half a day with comments pouring in to reassure that Cannes is most definitely on the cards for her. "Don't worry ma'am, one day you will be going to walk in the red carpet," read a comment while another added: "You will definitely walk in the red carpet in Cannes." Not just her "Cannes look" but Jennifer Winget's Instagram is filled with photos of several of her wardrobe changes and here are a couple. Jennifer Winget is currently playing the lead role in Bepannaah, before that she was seen in Beyhadh, for which she was critically acclaimed.